The ratio of positive-to-negative charge was calculated based on the cationic amine nitrogen (in the cationic lipids) and DNA phosphate group concentration. 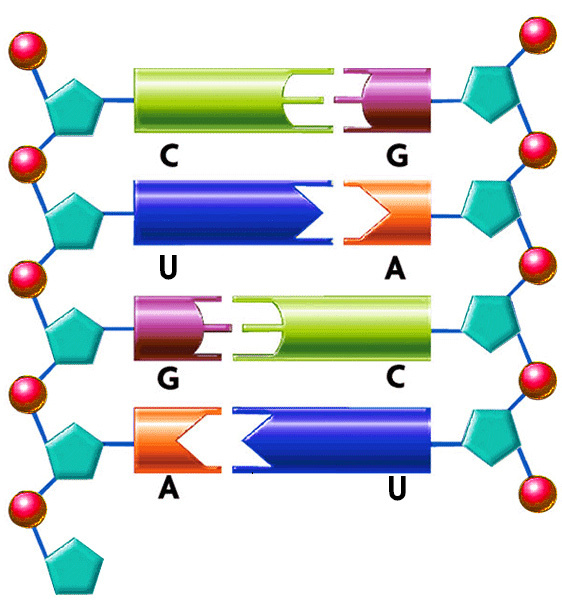 DNA and RNA are a polymer of nucleotides. They join themselves through phosphodiester bonds (a specific kind of covalent bond) that can grow up to as much as millions of nucleotides. DNA and RNA are negatively charged due to the existence of phosphate group that makes up every nucleotide (pentose + nitrogenous base + phosphate). When forming part of the phosphodiester bond, they retain 1 of 2 negative charges. The other negative charge is lost to form the other ester bond to a new pentose. That is the reason the bond is called “phospho-di-ester”. As an example, cationic lipid DOTAP has the following structure. DOTAP has one nitrogen and therefore, there is one positive charge per MOLECULE. 1 nmol of DOTAP contribute to 1 nmol of positive charge. Some cationic lipids contain more than one nitrogen, but not all nitrogen atoms carry a positive charge. For the other lipids, look at their molecular structure to find the number of the nitrogen atoms in the molecule. RNA, unlike DNA, is a single stranded molecule. However, siRNA is double stranded. As an example, in an siRNA molecule that is 21 bp long, there are 42 negative charges since there are 2 nucleotides in a base pair and each nucleotide carries one negative charge. 1 nmol of a monocationic lipid contribute to 1 nmol of positive charge. The cytotoxicity of the cationic liposomes increased as the molecular weight of the PEGylated lipid incorporated into the cationic liposomes increases. As an example lipoplex containing PEG5000 was more cytotoxic than a lipoplex containing PEG2000. The transfection activity of cationic liposomes decreases with increasing the percentage of PEG-DSPE lipid. Previous studies have shown that addition of 0.5% PEG-PE reduces activity down to 60%, 1% down to 40%o and 2% down to 10% of original luciferase activity in lungs. It was also been reported that adding PEG-PE (1% of cationic lipid) into the freshly formed plasmid-liposome complexes could prevent the complexes from aggregating during storage. However, storage of the complexes containing PEG-PE at 4 °C slowly restored the original activity. In general for transfection experiments PEGylation is not used. However, in some experiments especially in vivo experiment PEGylated lipoplexes are used. If you need to do an experiment which involves PEGylation of cationic liposomes then it is highly recommended to form the lipoplex first by adding the proper amount of the genetic material into the liposomes and next add PEGylated lipid externally (post-insertion) and incubate the lipoplex and the PEG lipid for one hour at a temperature which is above the liquid to gel phase transition temperature of the cationic lipid (in case of unsaturated cationic lipids such as DOTAP you can incubate at room temperature). In many experiments instead of using the traditional PEG2000-DSPE, C8-PEG2000-Ceramide is used for PEGylation of the lipoplex because PEG-Ceramide is a “sheddable PEG,” which diffuse out of lipoplex upon contact with biological membranes. Genesome® products are formulated using deionized RNAse-free water. Plain Genesome® is a white translucent liquid made of nano size unilamellar liposomes. Fluorescent Genesome® formulation is colored and the color depends on the type of the fluorescent dye that is used. Usually due to the small size of liposomes, no settling will occur in the bottom of the vial. The liposomes are packaged in an amber vial. 1. Santos RS, Dakwar GR, Zagato E, Brans T, Figueiredo C, Raemdonck K, Azevedo NF, De Smedt SC, Braeckmans K. Intracellular delivery of oligonucleotides in Helicobacter pylori by fusogenic liposomes in the presence of gastric mucus. Biomaterials. 2017 Sep 1;138:1-2. 2. Rabbani PS, Zhou A, Borab ZM, Frezzo JA, Srivastava N, More HT, Rifkin WJ, David JA, Berens SJ, Chen R, Hameedi S. Novel lipoproteoplex delivers Keap1 siRNA based gene therapy to accelerate diabetic wound healing. Biomaterials. 2017 Jul 31;132:1-5. 3. Dakwar GR, Braeckmans K, Ceelen W, De Smedt SC, Remaut K. Exploring the HYDRAtion method for loading siRNA on liposomes: the interplay between stability and biological activity in human undiluted ascites fluid. Drug delivery and translational research. 2017 Apr 1;7(2):241-51. 4. Hattori Y, Yoshiike Y, Honda M, Ohno H, Onishi H. Evaluation of Small Interfering RNA Delivery into Cells by Reverse Transfection in Suspension with Cationic Liposomes. Pharmacology & Pharmacy. 2017 May 15;8(05):129-39. 5. Faber K, Zorzi GK, Brazil NT, Rott MB, Teixeira HF. siRNA‐loaded liposomes: Inhibition of encystment of Acanthamoeba and toxicity on the eye surface. Chemical biology & drug design. 2017 Sep 1;90(3):406-16. 6. Duan L, Yan Y, Liu J, Wang B, Li P, Hu Q, Chen W. Target delivery of small interfering RNAs with vitamin E-coupled nanoparticles for treating hepatitis C. Scientific reports. 2016 Apr 26;6:24867. 7. Sun B, Shen H. Controlling surface-induced nanocomposites by lipoplexes for enhanced gene transfer. Journal of Nanomaterials. 2015 Jan 1;16(1):393. 8. Lechanteur A, Furst T, Evrard B, Delvenne P, Piel G, Hubert P. Promoting vaginal distribution of E7 and MCL-1 siRNA-silencing nanoparticles for cervical cancer treatment. Molecular Pharmaceutics. 2017 Apr 7;14(5):1706-17. 9. Bochicchio S, Dapas B, Russo I, Ciacci C, Piazza O, De Smedt S, Pottie E, Barba AA, Grassi G. In vitro and ex vivo delivery of tailored siRNA-nanoliposomes for E2F1 silencing as a potential therapy for colorectal cancer. International Journal of Pharmaceutics. 2017 Jun 20;525(2):377-87. 10. Falsini S, Ristori S. Lipoplexes from Non-viral Cationic Vectors: DOTAP-DOPE Liposomes and Gemini Micelles. Non-Viral Gene Delivery Vectors: Methods and Protocols. 2016:33-43. 11. de Ilarduya CT, Düzgüneş N. Efficient gene transfer by transferrin lipoplexes in the presence of serum. Biochimica et Biophysica Acta (BBA)-Biomembranes. 2000 Feb 15;1463(2):333-42.